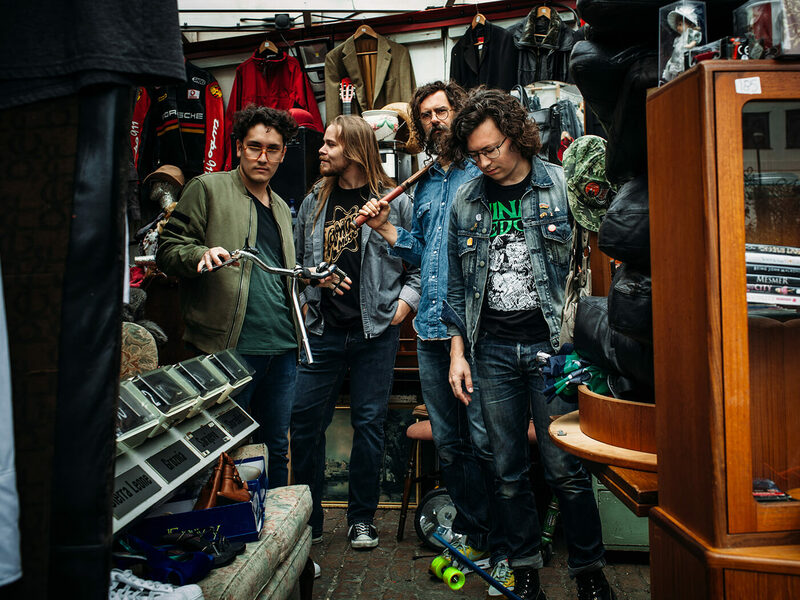 Frontman James Petralli talks about new album Side Effects, vintage gear and life on the road with the hardwearing Texan indie rockers. The Austin music scene is a wellspring for creative guitar music – from grizzled bluesmen of the 70s and 80s to the hip young things showcased at South By Southwest, the Texan capital has remained the place to go to get noticed. 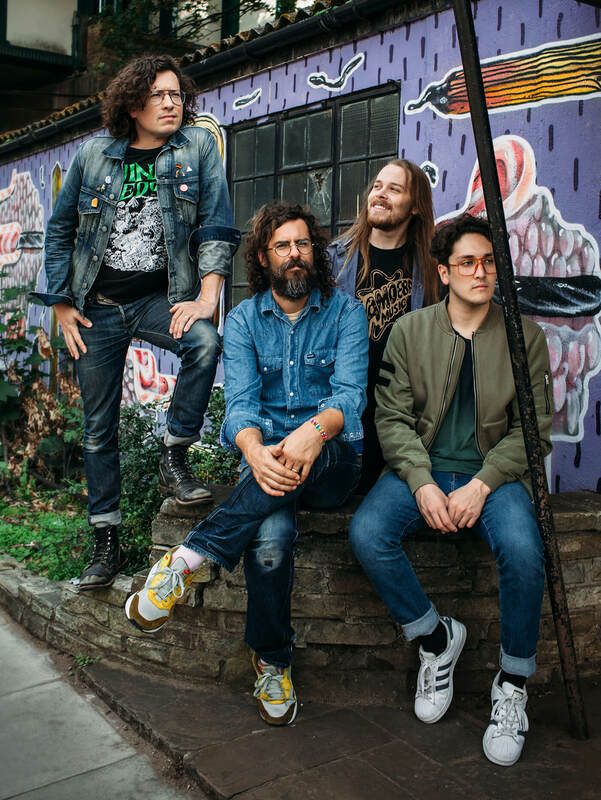 That was certainly the case when White Denim were starting out in the city back in the mid 2000s, though as frontman and guitarist James Petralli recalls, the band’s raw, lo-fi sound wasn’t exactly in vogue at the time. “The Killers were really big and everybody was trying to sound like Interpol,” James tells us. “And Austin, it felt like people were moving there, as we had, to make some kinda move – to play South By Southwest and so on. There was this kind of a trendy business-forward kind of approach to making music that we saw a lot… but our idea was to be really loud and obnoxious, and very different from the bands who did single-note, fourth-generation Joy Division rip-off stuff! If White Denim have always epitomised honesty and individuality ahead of trend-chasing, James’s guitar-playing journey didn’t start on such an authentic note. “I can remember starting to lie about being a guitar player, right around the age of 14 or 15!” James laughs when we ask about his early musical experiences. “I had this friend, Andrew who was a guitar player, and I remember telling him: ‘Yeah, I got a guitar for Christmas…’ and he kept wanting to come over. But every time he’d come over I would lie and say, ‘Yeah, uh, the guitar’s being worked on… it’s in the shop! The research would eventually pay off when a 17-year-old James saved up enough cash from his part-time job to buy himself an Epiphone Casino. “I was like, ‘Yup, that looks like the 345 Marty McFly played!’” James quips, but by this point, he was also heavily informed by the classic guitar music he’d immersed himself in. “I was really into The Beatles, and it was the ‘rooftop concert’ guitar as well. So I promptly removed the pickguard and played Bad To The Bone and Malagueña for hours and hours on end! “Pretty much right after I got that Epiphone Casino, I met Josh Block, our first drummer. He’d just finished his first year of Jazz Studies at UNT, so he was already a monster drummer. I met him at his band’s rehearsal, because someone who he was playing with sold nickel bags! Petrali and Brock worked on various projects together, before teaming up with bassist Steve Terebecki to become make a bluesy psychedelic racket as White Denim in 2006. The trio became a quartet with the addition of second guitarist Austin Jenkins and built serious momentum on the back of critically lauded and commercially successful albums D and Corsicana Lemonade. Then in 2015, Block and Jenkins unexpectedly quit the band, leaving the guitarist and bassist to carry on alone. To James and Steve’s credit, White Denim have hardly missed a beat – releasing three albums in four years, with both 2016’s Stiff and 2018’s Performance appearing in the UK album charts, all while the duo were backed up by a revolving cast of studio and touring musicians. As anyone who’s listened to the dying embers of The Clash on record will probably attest, working with an intentionally malleable line-up isn’t always the most creatively stimulating environment, but James has found the opposite is true. “Everybody has their strengths and their interests, and all that impacts the music that we’re making,” he insists. “There’s a guy that was in the band for awhile named Mike St. Clair, who I’m meeting with later. He’s not in the stage band anymore but I have a tune that I could really use his ears on. It’s helped me to open my ears up to other musicians and other techniques. It just made us more connected and better musicians by having different people in, and different voices in the room. “Our goal is to make something as good as it can possibly be before we give up on it! [laughs] We always want to unanimously like a piece of work. So I think that between the people who have been involved in the project, we have sometimes four, five or six people weighing in and you can kind of get a sense of whether or not it’s a good thing by the time you’ve reached hour 60 of working on a piece of music! The latest fruit of this process is Side Effects – an album that’s largely been created by James and his collaborators going back into the archives and re-examining offcuts from previous albums, and reshaping these ‘side effects’ and making them into something cohesive and fresh. “Having had our own studio since the early days means there’s just as much music that hasn’t been released as has been,” James explains. “It’s partly because we don’t want to give up on something that might not be working immediately. And because we’ll try to generally cut about 15 songs in one go, things can get put aside – not necessarily because they’re not good pieces of music, but because there are like seven songs that obviously really work together. “I got a SP-404, one of those Roland samplers, when we were touring Corsicana Lemonade ,” James recalls. “We’d hook it up to the car stereo and I’d ask for a song from each guy in the band, and then I’d take little samples from each song to try and make something in the course of an hour and then play it back for the guys. So with Shanalala, I was just getting to know what that machine could do. So I kind of dumped a bunch of drum samples from this iPhone app into the machine, and I can’t even remember what songs I had in, but the whole process started with a mashup/remix-y kind of approach. 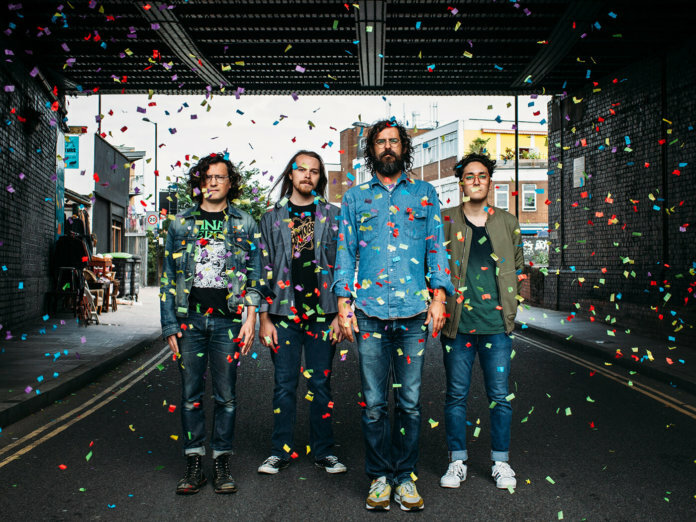 If White Denim’s sound, line-up and general approach to making music seems to constantly be evolving, James’ choice of guitars has stayed relatively consistent with the boy who was captivated by Marty McFly all those years ago. Another lesson learned from the live environment is that using fully hollow guitars on high-volume stages can be problematic, to say the least… “It’s going to be bad!” he jokes. “I use pretty small amps, generally. But the first vintage amp that I got was like the ‘Austin Special’. When you show up in Austin, you get a Fender Stratocaster and a Silverface Twin! That’s exactly what I got when I moved here, but I didn’t have the Strat. “So I spent a year and a half looking at frowning sound guys who are just like: ‘What are you doing…?! The wah-wah is how you get a boost? !’ I had a really unpleasant guitar combination – like a super-spiky tone. But then I thought, ‘I don’t wanna be their enemy the minute I walk in,’ so I kicked the volume back, and I realised that I didn’t really need a Twin! Then I started getting into these Silvertones – the Sears amps – and I ended up getting four or five of those things so that I’d always have one on the road. With over a decade in White Denim’s rear-view mirror, we can’t help but wonder whether all the changes to the band both in terms of personnel and sound has changed their attitude to making music and being musicians. Yet James is adamant that they remain true to the blue-collar ideals they started out with. “Y’know, I think the main goal remains the same,” he stresses. “We’re working on becoming better players and better writers. We still like the same stuff that we always have. We don’t really follow fashion so to speak – we’re always finding new music, new techniques, new sounds and all that kind of stuff. We just have our own interests, and the commercial viability of a song or a record is often like the fourth thing that we talk about when making something! White Denim’s new album, Side Effects, is out now on City Slang.